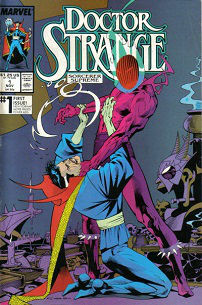 Tom DeFalco became Editor in Chief in late 87 (by cover date). DeFalco was known for backing his editors' decisions when there were disputes with creators, and also for a more nostalgic outlook on comics with a fondness for the Silver Age. At the same time, he was very reactive to market opportunities, and the trend towards grittier and violent books continues. Unlike Jim Shooter, DeFalco was not a Vice President with Marvel's owners, New World, and the market pressures from that company are visible in the expansion of the Marvel line without regard for brand dilution. A number of new titles are created this year, including several X-titles: Excalibur, Wolverine, and X-Terminators (which may have been intended as an ongoing). This is in addition to the creation of a bi-weekly Marvel Comics Presents, which would feature an X-character (Wolverine for all of this year) as the headliner. The Punisher also gets a second book. 1988 sees three major crossover events: Fall of the Mutants, Evolutionary War, and the beginning of Inferno. We're also back to the "regular" mini-series (after last year's experiment with the Vs. books) with Black Panther, Spellbound (which has a New Mutants appearance) and the prestige format Nick Fury vs. SHIELD. Mark Gruenwald is Executive Editor filling the position vacated by DeFalco when he was promoted to EiC. Dwayne McDuffie is announced as an editor with the March Bullpen Bulletins (his first Damage Control series is also included in this year even though it was published in 89). In September, a major editorial shuffle is announced, with several Assistant Editors, including Bobbie Chase and Terry Kavanagh, getting promoted to full editor. There are many categories of pricing at this point. Regular books that have both newsstand and direct market distribution remain at 75 cents throughout the year. But beginning with the May issues, there's this announcement in the Bullpen Bulletins: "This month, nine of Marvel's top titles [all the Spidey and X-books, (East Coast) Avengers, Punisher, and Silver Surfer] will cost you a quarter more than the rest of the Marvel line, with no change in format, contents, or page count." This is due to increasing printing costs, and the decision was to let the more popular titles take the brunt and basically subsidize everything else. That's the opposite of the modern approach, where the lower selling books have a higher cover price. In addition to that, Direct Market only books begin at a dollar but then increase in price and run between $1.25 and $1.50. Annuals are $1.75. Creator notes: An interesting dichotomy during this period is the rise of young artists with very new styles at the same time that we're seeing a return to older writers and sensibilities. So we have Todd McFarlane moving from Hulk to Marvel's most prominent title, Amazing Spider-Man. 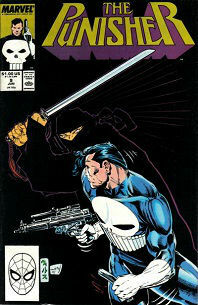 Jim Lee moves from Alpha Flight to Punisher War Journal. Ron Lim begins his run on Silver Surfer. Whilce Portacio is on Punisher. Mark Silvestri remains on X-Men. But at the same time we have the return of Gerry Conway to Spider-Man, Doug Moench and Steve Gerber in Marvel Comics Presents, a very retro (if beautifully illustrated) Tom DeFalco/Ron Frenz Thor, and the straight-from-1963 Speedball by Steve Ditko. Additionally, we see signs of an empowered editorial. Both Avengers titles see editorially dictated changes that result in the writers (Roger Stern and Steve Englehart) getting fired from the books. The X-titles get consolidated under Bob Harras and the division between X-Men and X-Factor begins to break down as we move towards Inferno. And Chris Claremont was told that if he didn't write the Wolverine solo book, someone else would. It's worth noting that DeFalco and Gruenwald, both executive editors, wrote regular titles during this period. Peter David's Hulk, the Ann Nocenti/John Romita Jr. Daredevil, and the continued Michelinie/Layton Iron Man run (with M.D. Bright and then Butch Guice on pencils) are highlights. Mike Baron's Punisher run is also solid, and we still have Chris Claremont on X-Men. The joint Simonson's X-Factor is at a peak in the period between Fall of the Mutants and Inferno. Walt Simonson also has a run on Avengers, following Stern, but the results are mixed. Marshall Rogers continues to do nice work on Silver Surfer before being replaced by the also nice Ron Lim. The Michelinie/McFarlane Amazing Spider-Man run has its faults but is pretty good. On the other end of the spectrum, Alpha Flight is just terrible, and Speedball should best be looked at as a patronage program for Steve Ditko. New books include the Wolverine solo series, Excalibur, Speedball, Punisher War Journal, and Marvel Comics Presents. 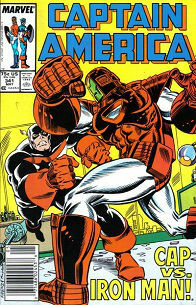 There's also the Solo Avengers book that began in late 87. In the prestige format Nick Fury vs. SHIELD miniseries, SHIELD is disbanded. The Strange Tales split book is cancelled and Cloak & Dagger and Dr. Strange get their own books back. The Thing and Sharon Ventura mutate, with Ventura becoming a She-Thing. Fall of the Mutants, resulting in the "death" of the X-Men, the real death of Cypher, and the revelation of Angel as Death. Iron Man concludes his Armor Wars. The Evolutionary War event runs across all of this year's annuals. The Beast returns to his blue and fuzzy form, albeit now with super-strength. The Hulk gains a new status quo as an enforcer in Las Vegas. We're re-introduced to Madripoor (after a brief earlier appearance in New Mutants). We're also introduced to the island nation of Genosha. Major line-up overhauls in both Avengers books, and Crystal leaves the FF. X-Terminators #1 Inferno begins. 1st Wiz Kid.